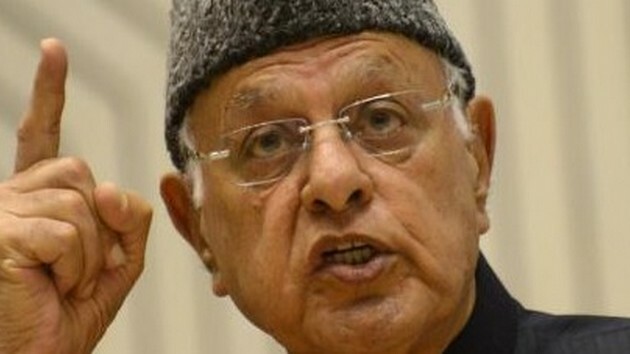 Srinagar:Hitting out at Prime Minister Narendra Modi for accusing the Abdullahs and Muftis of trying to break India, National Conference (NC) president Farooq Abdullah said that if his family had wanted to break the country, there would have been no India. Dr Abdullah, who is seeking re-election from Srinagar Parliamentary constituency, was referring to Mr Modi's comment during a rally in Kathua on Sunday, accusing both the Abdullah family and the Mufti family of destroying the lives of three generations of Jammu and Kashmir. The NC president alleged that it was Mr Modi, who was trying to break the country. However, he said the country will not break. "NC fights for the rights of all the people, irrespective of their religion and we will continue to fight. Even if PM Modi tries his best, he will not be able to break India. I want to tell him from here today that you will break, but India will not. "You accuse the Abdullahs of trying to break India, if we wanted to break India, there would have been no India then," Dr Abdullah said, while addressing a rally in S K Park, here. Dr Abdullah said Mr Modi has been parroting that Kashmir is the 'Atoot Ang' (integral part) of the country, then why didn't he address any public met here in Kashmir. "What barred him from doing that," he asked. "On one hand, he parrots about winning hearts and minds of Kashmiri, but there is a world of difference between his actions and statements. How can the heart be won by banning highways" This is not the way to win hearts," he added. Dr Abdullah, who is the former chief minister of J&K, said Mr Modi should remember that it was him, who held the country's flag when no one wanted to fight elections in the state in 1996. ?Modi should remember that in 1996 when no was ready for elections in J&K; it was me who went ahead even as my colleagues said we should not contest. I wanted the people to get rid of the difficulties they were facing... You (Modi) should never forget that. There was no one here then, but now you scream," he said. Lashing out at BJP, he said, "We don't need the saffron party's certificate on nationalism, it was a Kashmiri Saifu din Kitchloo, who lost his life at Jalianwala Bagh, he was from Baramulla." Why hasn't PM Modi and BJP spoken any word of praise for them, he asked. "Many among those who were massacred by General Dyer were from Kashmir. We need no credentials from PM Modi. Nation is seeking answers from PM Modi as to what was he able to achieve on the promises he made to people during his election campaign in 2014. ''No sooner anybody ask him about his achievement, he is tainted as anti national. People want to know where the 10 crore jobs are" People want to know what laurels was the Modi led government able to achieve on development front; people are feeling ditched. The incumbent BJP led central government is mute on its achievement, how could they enumerate any when there are none," he said. Applauding the decision of NC Vice President Omar Abdullah and the party of not forging alliance with BJP in 2014, he said, "I was undergoing my treatment overseas; however BJP and its cronies had approached Omar and other party members for hobnobbing an alliance. However, the recourse taken by Omar and other associates of his worth appreciation."